Crime Watch: Staalesen is Scandinavia's Top Gun(nar)! Staalesen is Scandinavia's Top Gun(nar)! 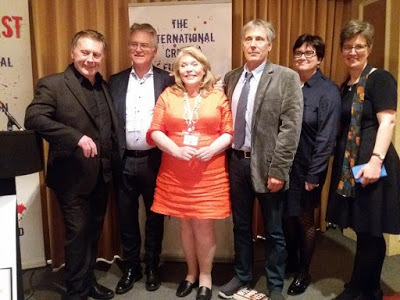 An author described as "the finest Nordic novelist in the private-eye tradition of the American masters" scooped the prestigious Petrona Award at the Gala Dinner at Crimefest in Bristol on Friday evening. Norwegian author Gunnar Staalesen, along with his translator Don Bartlett, won the 2017 Petrona Award for WHERE ROSES NEVER DIE (Orenda Books). Staalesen was presented with the trophy by last year's winner, Jorn Lier Horst. In WHERE ROSES NEVER DIE, grieving private detective Varg Veum is pushed to his limits when he takes on a cold case involving the disappearance of a small girl in 1977. As the legal expiry date for the crime draws near, Veum’s investigation uncovers intriguing suburban secrets. The Petrona judging panel called the book "both a coruscating and ambitious novel from the veteran writer, and a radical re-working of his customary materials - perhaps the most accomplished entry in the long-running sequence of books about Bergen detective Varg Veum". Now in its fifth year, the Petrona Award was established to celebrate the work of Maxine Clarke, one of the first online crime fiction reviewers and bloggers, who died in December 2012. Clarke, whose online persona and blog was called Petrona, was passionate about translated crime fiction, but in particular that from the Scandinavian countries. The Petrona Award celebrates the Best Scandinavian crime fiction translated into English, and is awarded to both the author and translator. Previous winners were Liza Marklund for LAST WILL (2013), Leif G W Persson for LINDA, AS IN THE LINDA MURDER (2014), both translated by Neil Smith, Yrsa Sigurdardottir for THE SILENCE OF THE SEA (2015) translated by Victoria Cribb and Jørn Lier Horst 's THE CAVEMAN translated by Anne Bruce. The judges of the Petrona Award are Barry Forshaw (EURO CRIME, BRIT NOIR, etc), Dr Kat Hall (CRIME FICTION IN GERMAN: DER KRIMI), and Sarah Ward (IN BITTER CHILL, A DEADLY THAW), with British librarian Karen Meek (Eurocrime) acting as administrator. You can find out more about the Petrona Award and past winners and finalists here.